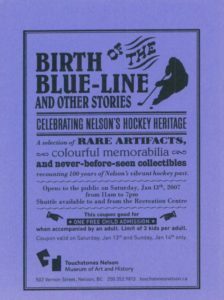 Celebrating Nelson’s hockey heritage – this exhibition comprised of hockey artifacts, memorabilia, moments from Nelson’s hockey history and colourful anecdotes – it ran concurrent with CBC’s Hockey Day in Canada events at Nelson’s Recreation Centre on Saturday, Jan 13th, 2007. Exhibition sponsored by the Nelson Economic Development Partnership. Exhibition sponsored by 2010 Legacies Now, Touchstones Nelson: Museum of Art & History, Nelson & District Credit Union, Hall Printing and Nelson & District Chamber of Commerce. A group exhibition (18 artists) of contemporary craft and design, and the first Alumni exhibition in the school’s forty-eight year history. The opening coincided with KSA Alumni reunion events. In partnership with Kootenay School of the Arts at Selkirk College. Presented in celebration of 2007 The Year of Craft. Exhibition sponsored by Arts Now, Columbia Basin Trust, Columbia Kootenay Cultural Alliance, and Nelson & District Credit Union. 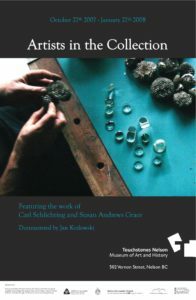 A group exhibition (25 artists) of contemporary craft and design by past (10 artists) and present (15 artists) faculty of Kootenay School of the Arts at Selkirk College. In partnership with Kootenay School of the Arts at Selkirk College. Presented in celebration of 2007 The Year of Craft. 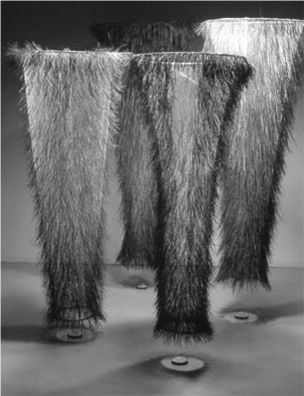 A group exhibition (17 artists) of contemporary craft and design featured the 2007 graduating class from the regional institution of art and craft education, recently amalgamated with Selkirk College. 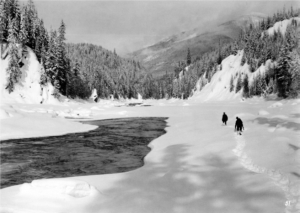 Over 60 stunning historical photographs, gathered from 30 collections, showed the unobstructed Columbia River flowing from its source in the mountains of Canada to the waters of the Pacific Ocean. An artful blending of the photographs with maps, poetry, soundscapes, text and hand painted illustrations of native Columbia River fish captivated visitors’ senses. Organized by the Wenatchee Valley Museum. Exhibition sponsored by Columbia Power and Columbia Basin Trust. Ursula Heller, the Swiss-born and Proctor-based photo-documentarian showed her body of work titled POWERHOUSE. Comprised of 100+ black and white images, the work spans the inception of the Brilliant Expansion Project in 2003 to approximately mid-way, in 2005. Ursula visited the site regularly, documenting the progress which is slated for completion in 2008. Decked out in a caution-orange safety vest, steel-toed boots and camera equipment, she became a recognizable figure to the workers on-site. The images capture the faces and character of the people against the grand scale of the mountain, over-sized excavation equipment and the resulting concrete structure. POWERHOUSE is part of a series dedicated to workers in the Kootenays. Project sponsored by Columbia Power Corporation and Columbia Basin Trust. Haruko Okano is an interdisciplinary artist from Vancouver, who was in Nelson this summer as the 2007 Artist-in-Residence at the Oxygen Art Centre, where she created new work during her one-moth residency. Touchstones hosted an exhibition of her past work, entitled Arboretum Arborescence, an installation of flue forms comprised of collected natural detritus that combine to offer a visual, odiferous and tactile sensory reference to the natural world. The exhibition at Touchstones featured Commentree, a community-engaging component that invited the community to respond to Arboretum Arborescence by adding personal commentary – the result was a smattering of spontaneous poetry on the floor beneath the piece. In partnership with Oxygen Art Centre, 2007 Artist-in-Residence. Exhibition sponsored by Cowan’s Office & Art Supplies. Spun out of two ideas: What happens when an everyday item is changed into something familiar yet different? 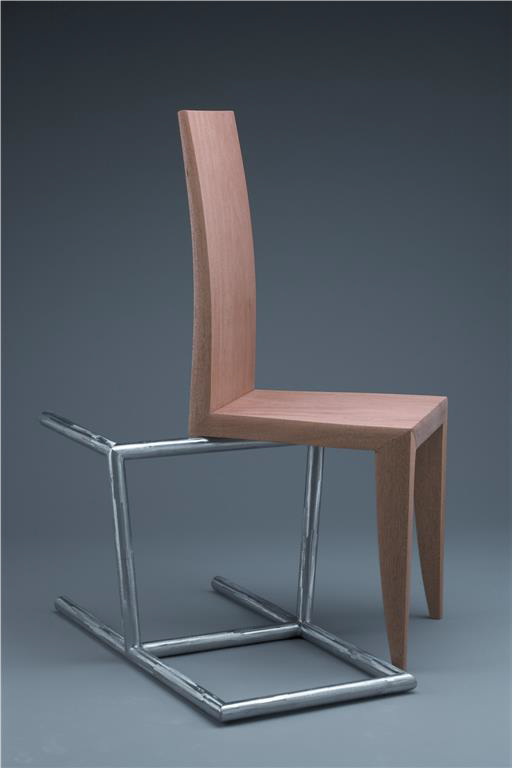 What if one takes a very familiar object, like a chair – an object older than any other piece of furniture and whose design over the ages has integrated the beliefs, fashions and histories of the time – and does something different with it? The exhibition 2 Chairs invited leaders within the studio furniture domain to ponder these ideas and produce two chairs in response – one functional and one conceptual. The exhibition participants who answered that challenge are: Wendell Castle, Heidi Earnshaw, Mike Elmitt RCA, Peter Fleming RCA, Michael Grace, Stephen Hogbin RCA, Michael Hosaluk RCA, Gord Peteran RCA, Peter Pierobon RCA, and local artist, Michael Grace. 2 Chairs was a touring exhibition from the Agnes Jamieson Gallery in Minden, Ontario, developed by Curator Laurie Carmount. Exhibition sponsored by Agnes Jamieson Gallery, Royal Canadian Academy of Art, Canada Council for the Arts, Ontario Arts Council, A&M Wood, Nelson and District Credit Union. PRECAUTION is a body of photo-based work by Vancouver artist Florence Debeugny. It was while photographing an abandoned shipyard that she first noticed CAUTION printed on yellow plastic tape and the omnipresent warning became evident to her. 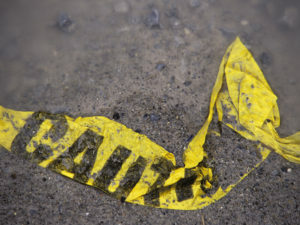 She then began photographing the many CAUTION signs adorning Vancouver industrial and commercial sites, documenting the lifespan of CAUTION tape as it was transformed from brand-new and shiny with its sharp black letters, posing a forbidding linear barrier, to a dejected-looking shapeless form, no longer able to stand at attention and perform its intended role. Two local artists, Carl Schlichting, sculptor and Susan Andrews Grace, writer and mixed-media artist, were busy at work in Touchstones’ Permanent Collection early last summer. Acting in the dual role of curator and artist, each researched and selected items from the Collection, considering such aspects as the artifacts’ historical provenance, and created a body of work in response to their interpretations. The exhibit, curated by each artist within the exhibition, featured the historical items that inspired the artist alongside the new works produced. Photographer, Jan Kozlowski, was on hand throughout the project, documenting the exploration of each artist, from the initial research in the Collection through to making new works in the studio. The images accompanied the exhibition, providing insight into the creative process and a behind-the scenes look at producing an exhibition. 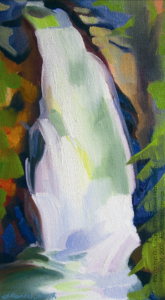 Exhibition sponsored by Columbia Basin Trust and the Columbia Kootenay Cultural Alliance. The Irene and Andre Orbeliani Collection is a contemporary art collection comprised of over forty, two-dimensional artworks, primarily paintings and prints that were collected over a thirty year period from local artists who have made Nelson and the surrounding area home. Irene and Andre Orbeliani resided in the Kootenays for almost half a century. They both came from families of artists and added to an already existing family art collection with the work they acquired here. They were strong supporters of Nelson having a public art gallery and bequeathed the Collection to the Nelson Museum, Archives, Art Gallery and Historical Society (Touchstones’ legal identity) in 1999 as a founding collection for the new gallery that would eventually open in 2006 – the new museum and exhibition space Touchstones is today. The exhibition featured approximately twenty paintings from the Collection, exhibited in Gallery B from November 17th to January 6th, 2008.